September 25, 2018 Posted in Photo, The Americas. We sent Yodeler Sveta Damiani to The Cromwell Las Vegas Hotel & Casino to create a Cromwell Travel Guide. The Cromwell presents the Strip’s first Las Vegas standalone boutique hotel. 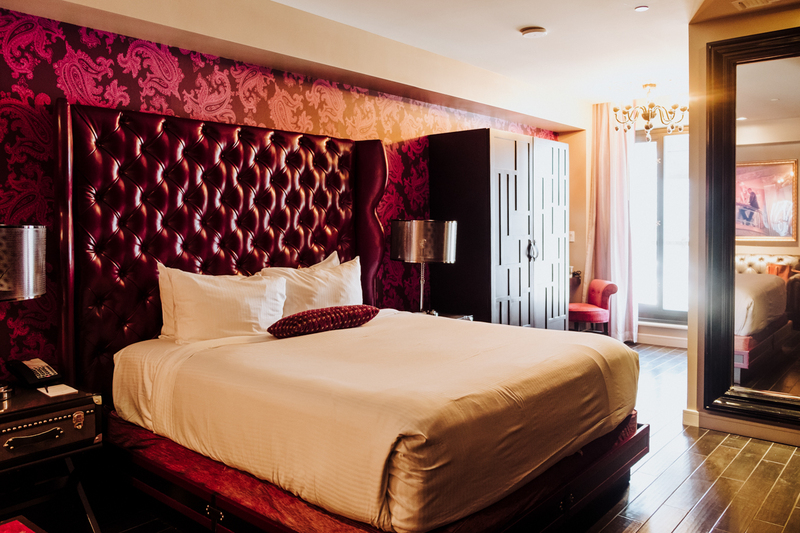 Each of the 188 rooms features luxurious accommodations in an intimate, Parisian-inspired atmosphere. The Cromwell also offers player-friendly gaming, free live entertainment nightly at Interlude Lounge, personal concierge service with Ivy and great food offerings. Sveta created an incredible travel guide full of beautiful photos, secrets and destination tips just for you. Can you sum up Las Vegas? Las Vegas is a metropolis nestled in the Nevada desert, a place of vast casinos, luxury hotels, award-winning restaurants, and spectacular entertainment venues that attracts more than 40 million visitors each year. It’s a place that has to be seen to be believed, a city that never sleeps. Las Vegas is vibrant and colorful, and everyone should visit it at least once. What is the best thing about Las Vegas? The best thing about Vegas is that it can be whatever you want it to be. There’s such a wide selection of attractions that anyone can find something they’ll like. World-famous entertainment shows, stand-up comedians, art, restaurants, landmarks, parks, activities for tourists – Vegas has it all! What is a common misperception about Las Vegas? Some people choose not to visit Las Vegas because they think it’s nothing more than an adult’s playground where you’ll find only casinos and bars, but the truth is Las Vegas has those things and much more. If you’re not into gambling, you can attend a world-class show, embark on a foodie adventure, or explore the natural wonders outside of the city. What are the people like in Las Vegas? In a city where you can be whatever you want to be, surprisingly the people choose to remain themselves. During my stay, I had several interactions with locals, and I was amazed by their kindness and sincerity. Their lives are not endless parties. They are regular people living regular lives. I highly recommend exploring different neighborhoods of Las Vegas to get a sense of what it’s like to live there year-round. If Las Vegas was a person who would it be? Las Vegas is Cary Grant. He’ll take you out for an adventure at night where you’ll experience both a little mischief and a little mystery. Can you tell us about your experience at The Cromwell? The Cromwell Hotel is not your average Las Vegas hotel, as it’s the only boutique hotel on the Strip and has only 188 rooms. It took only a short 10-minute Uber ride from the airport to the hotel’s front door, and once I arrived I was pleasantly surprised by the quick check-in process. Since the hotel is small compared to most others in the area, there were no lines whatsoever. The concierge greeted us with a friendly smile, offered us bottles of water, and showed us the way to the hotel elevators. We stayed in a Luxury Room with a Strip view on the 6th floor. I appreciated the Parisian-inspired design – the hardwood floors, ornate wallpaper, buttoned leather headboards of the bed, and antique trunk-style furniture. Our room also had a separate vanity with all the essentials – including a straightening iron! The location of the Cromwell Hotel couldn’t be better – it shares an intersection with the Bellagio, Caesars Palace, and Bally’s Las Vegas. Needless to say, it was incredibly easy to walk everywhere! Before dinner, we enjoyed spending time at the Interlude Casino Lounge on the first floor. It always has high quality live entertainment, and happy hour there is one of the best in town! We ate twice at GIADA and really enjoyed the food there. For more casual dining there’s eatwell on the first floor. Open 24 hours a day, eatwell serves sandwiches, lots of pastries and desserts, and Starbucks coffee. On our last morning in Vegas, we ordered room service from there – it was quick and very easy. Overall, my friends and I had a wonderful stay at the Cromwell Hotel and would go back in a heartbeat! One thing I really appreciated about the hotel was its size. It’s a lot smaller than the other hotels around, and as a result, the service is exceptional and the atmosphere very intimate. Also, the location of the Cromwell Hotel is just perfect – right at the heart of the Strip. It was so easy to get around! To sum it all up, when you choose the Cromwell, you get a personalized boutique experience that you can’t get anywhere else on the Strip! What activities did you participate in at The Cromwell? The Cromwell is host to GIADA, the first restaurant from Emmy Award-winning chef Giada De Laurentiis. My friend and I were fortunate enough to eat there twice during our stay. On Friday night we got a table next to the window overlooking the Strip. While we were drinking wine and enjoying our meal, we watched the sun sink below the horizon and the city lights turn on one by one – such an amazing sight! The food was beyond delicious. We had Truffle Burrata with Campari tomatoes and micro basil, Bacon Wrapped Dates, Ravioli with lobster & crispy artichoke, and Fettuccine with garlic scampi with heirloom tomato. We loved the dinner so much that we decided to go back the next morning for brunch and it did not disappoint! Drai’s Beachclub is located on the rooftop of The Cromwell, and as you might expect, the views from there are spectacular! Cromwell guests receive free entry – another great reason to stay at the hotel. The beach club opens to the public at 11 am, but hotel guests are allowed to go up an hour early to enjoy the pool before it gets too crowded. I honestly couldn’t think of a better place to spend a day in Vegas. The atmosphere there is amazing – the music is great and surprisingly, it doesn’t feel nearly as hot up there as it does on the street! In any case, we had reserved a daybed with an umbrella. It was nice to have a place where we could hide from the sun and eat a few snacks. Speaking of snacks, Drai’s Beachclub offers a great selection of food and drinks – salads, hot dogs, flatbreads, avocado toasts, nachos, chicken wings, sandwiches, etc. But my favorite thing from the menu was the half watermelon. It was sliced in cubes and garnished with berries – such a refreshing treat! If a friend was visiting Vegas for 24 hours what would you suggest they do? Start the day by waking up early and heading over to Freemont Street – this is where the locals like to go to. There are tons of restaurants and cafes where you can grab breakfast, and the prices here are often a lot cheaper than on the Strip. After breakfast explore the area and its unique shops, casinos, beautiful street art, and live music performances. If you’re into sweets, I would suggest stopping by the Donut Bar, an artisan bake shop, for a quick sugar fix. Their donuts are so good! From there you can walk or take a 5-minute ride to the Arts District, where you can find art galleries, museums, and more impressive street art. After exploring the Arts District, head over to Caesars to visit Gordon Ramsay Hell’s Kitchen. Make sure to check their Prix Fixe lunch menu and add wine pairings if you’d like. After lunch, take a little break from the heat and sun at the Forum Shops. Known as “The Shopping Wonder of the World,” the Forum Shops is not your average mall – it’s quite a unique experience. For dinner, you should try out GIADA in the Cromwell Hotel, right across the street from the Fountains of Bellagio. This is a very popular spot, so you’ll definitely need to make a dinner reservation beforehand. Make sure to request a table by the window. That way you can enjoy your amazing Italian dinner and have a beautiful view of the Strip. After dinner, catch one of the spectacular shows Las Vegas is famous for. After the show, you can head over to the High Roller Observation Wheel and take the 30-minute ride to enjoy the best views of the city. After that get off the Strip and pop into the Golden Tiki Bar to try one of their delicious signature drinks. It’s a great place to end your day in Vegas. Get the Las Vegas Explorer Pass, it’s a pre-paid sightseeing card which includes free entry to your choice of 3-7 top Las Vegas attractions.